Welcome to our farm! We are the 4th generation to nurture this farm. Through the years we have grown in knowledge and approach to the crops that we have grown. 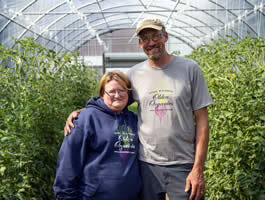 We are now focused on growing what we grow well, what grows well in our soil, and what we love to grow. In addition we are always trying a few new crops each year and refining our current crop growing techniques. If you can't visit us in person, please view some of Olden's vegetables and fruits that we produce right here in Wisconsin. 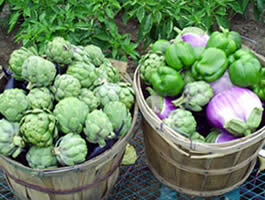 CSA Market Share as the name implies allows you to get your food from a local source and support your local economy. 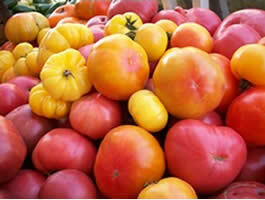 Olden Organics has received many awards and grants for our produce farm and love of our community. 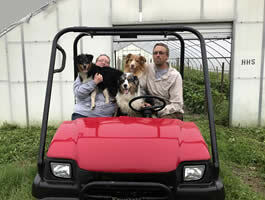 Here we are with our dogs at Olden Organics farm.